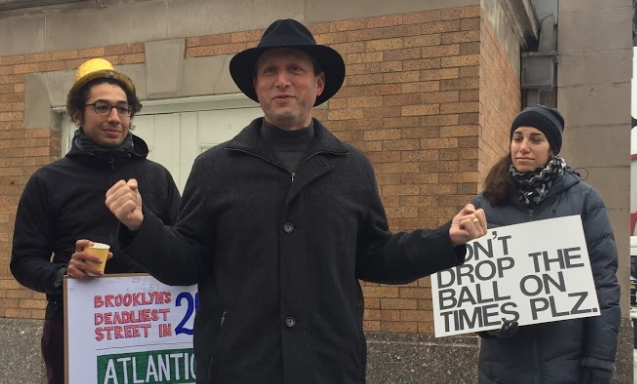 On Saturday, Brooklyn elected officials gathered in the cold with volunteers for Transportation Alternatives and called on the city to improve the hellacious walking environment at the intersection of Flatbush, Atlantic, and Fourth Avenues. The three streets that converge at this location, known as Times Plaza, are all wide avenues with some of the worst crash rates in Brooklyn. To navigate the area, which includes the biggest transit hub in the borough, the Barclays Center, and the Atlantic Terminal mall, pedestrians must contend with long, oblique crossings and several lanes of two-way traffic. Since 2008, four pedestrians and one cyclist have been killed at or near the intersection. Speaking at Times Plaza in February, Brooklyn Borough President Eric Adams, Council Member Brad Lander, and Assembly Member Jo Anne Simon blasted DOT and Barclays Center developer Forest City Ratner for proposing landscaping and amenities for Times Plaza before coming up with a pedestrian safety plan for the area. In August, DOT presented an initial safety plan [PDF], calling for median pedestrian islands, curb extensions, and the reduction of some traffic lanes. 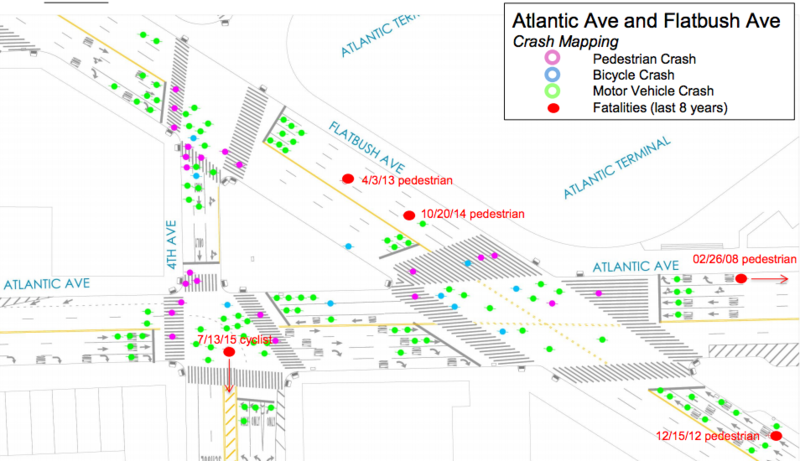 Nearly four months later, not much has been implemented, except for a median island on Fourth Avenue below Atlantic. Saturday’s rally coincided with the release of a TA report outlining what DOT should do along the whole 10-mile stretch of Atlantic Avenue, which is supposed to be a flagship safety project in Mayor de Blasio’s “Vision Zero Great Streets” initiative. We’ll have more on the report later today.